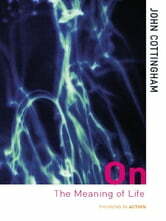 The question 'What is the meaning of life?' is one of the most fascinating, oldest and most difficult questions human beings have ever posed themselves. In an increasingly secularized culture, it remains a question to which we are ineluctably and powerfully drawn. Drawing skillfully on a wealth of thinkers, writers and scientists from Augustine, Descartes, Freud and Camus, to Spinoza, Pascal, Darwin, and Wittgenstein, On the Meaning of Life breathes new vitality into one of the very biggest questions.